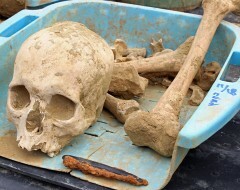 Human remains unearthed in an Imperial Japanese Army shelter. Zensei Takaesu works on collecting remains in the shelter in the Maeda district of Urasoe. A volunteer collecting remains of war dead unearthed ten sets of human remains in an Imperial Japanese Army shelter in the Maeda district of Urasoe on December 28. Nine of them had teeth, creating the possibility for the researchers to collect DNA samples. Some of the items found have names on them, such as “Kuniyoshi” on a razor and “Araki” on a triangle ruler. This may assist in identifying the remains. Takaesu started excavating from July after gaining permission from the landowners. He has worked collecting remains with 71 people helping him along the way. All of the remains had little damage. The passage of 68 years since the end of the war has seen about 180 centimeters of dirt build up in the shelter and the walls calcify. Takaesu plans to put the earth dug out of the shelter back within the year. Maeda was the scene of some of the most significant and bloodiest fighting during the Battle of Okinawa. More than 60 percent of the Japanese soldiers killed in the battle died at the front line that ran from Kakazu to Shuri and included Maeda. A razor bearing the name "Kuniyoshi" and the bones thought to be of its owner.